At its MAX conference in Los Angeles today, Adobe showed quite a few products that will soon be available to its customers, but it also highlighted a number of hardware experiments, including Project Context, a totally re-imagined way for creating magazine layouts, as well as an advanced stylus and a ruler for touchscreens. After the keynote this morning, I had a chance to sit back with Adobe’s David Macy to talk about both the newly announced Mighty pen and Napoleon ruler for touchscreens, as well as Project Context. All of these projects are definitely more than just hobbies for Adobe, something Macy acknowledged when I asked him about the company’s plans for these tools. While Macy obviously wouldn’t talk about when (or even if) Adobe plans to turn these prototypes into products, my feeling was that the company is clearly thinking about it. It’s also clear that the Adobe XD team, which is behind all of these projects, has the backing to explore these ideas. The idea for the Mighty Pen, for example, was born about a year and a half ago and the team has been iterating on the idea ever since. Out of the three projects, Project Context is clearly the one that is the most “out there” right now. It’s easy to imagine Adobe selling pens and rulers, but when it comes to giant touchscreens, that’s not exactly the company’s core focus. Right now Context is focused solely on magazine design, but because it runs on OS X (and actually uses two Macs for each screen), the system could be adapted for other uses as well (and Macy wouldn’t say if Wired or Conde Nast have any plans to use it in their actual production process). As Wired’s design director Claudia de Almeida noted when she demoed the project on stage today, layouts in newsrooms today are often still created physically with paper, scissors and boards where designers arrange their layouts. “The wonderful thing about Project Context,” she said, “is that it takes the best of what we do in the analog world and recreates it digitally.” That, of course, is also true of Adobe’s other two hardware projects. 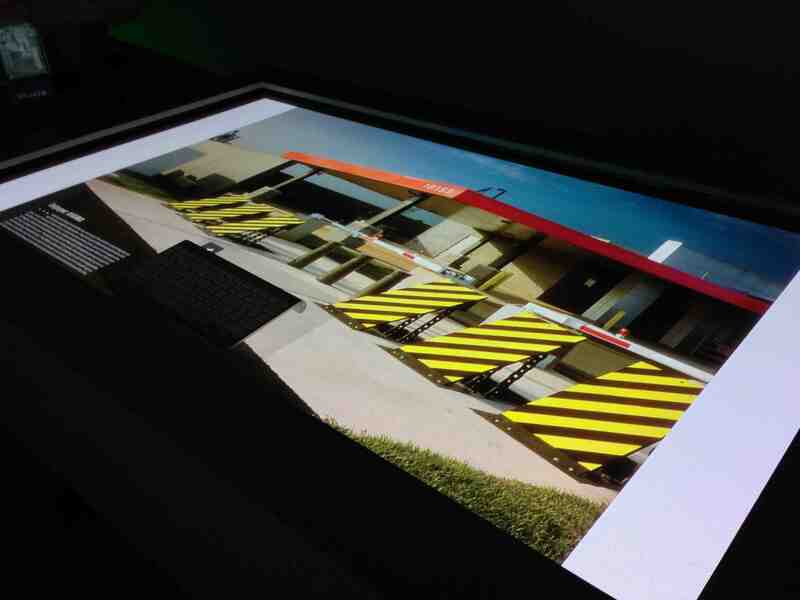 The Context system uses two 1080p high-def screens with a frame around it for picking up touch signals, as well as another screen set up as a Surface-like table in front of the other two screens. Because the screens are so large, you can actually see the individual pixels, but Macy hopes that once 4k screen become more affordable, that won’t be an issue. There is also something about having these huge touchscreens that gets people energized, he said. It’s a great tool for team collaboration, Adobe believes, and the prototype currently supports up to 30 touch points. I had a chance to play with Project Context behind the MAX stage and it’s indeed a very cool experience. The layout is, for the most part, the interface. Assets are available in a horizontally scrolling bar at the top of the page and to add them to the layout. Swiping left and right with multiple fingers allows you to scroll, touching an image with one finger allows you to move it around on the page (or between pages) and you can obviously resize images, pages and perform other actions. The prototype also includes a web browser, though it was deactivated for the demo today. 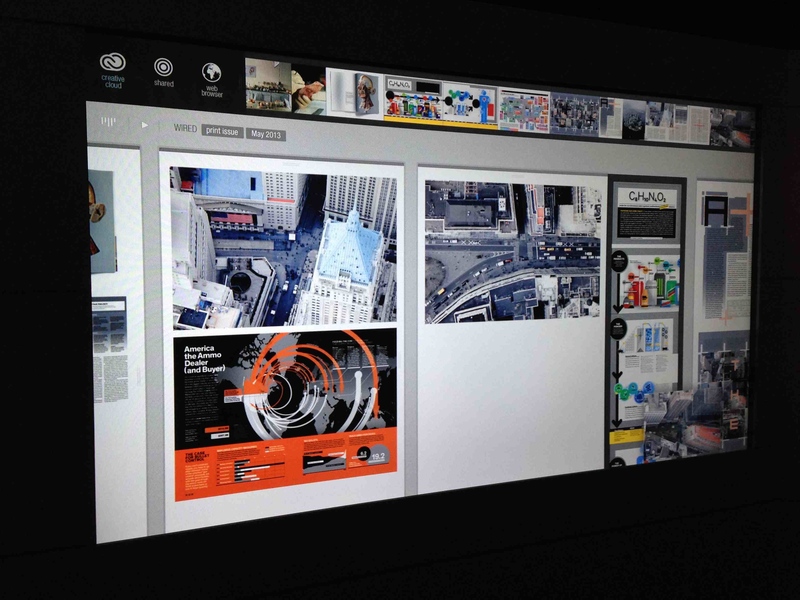 In addition to the two-screen system, Adobe uses the Surface table-like setup that users can send individual images to. Users can put a keyboard on it and start writing notes onto the image or just start drawing on it with their finger. Once you’re done, you just swipe it back in the direction of the main screens and it’ll show up there again. Adobe’s first idea, by the way, was to build a room that could be outfitted with Kinect-like sensors, Wii-like remotes and similar technologies. Adobe actually ended up building this room, but in the end, however, Macy said, “making gestures in the air just felt silly.” Once you have a touchscreen, touching just becomes the natural way to work with the software. The next project for the team, then, was to build a touchscreen-based drawing table (the team’s leader is a former architect). Using virtual rulers and similar tools just didn’t make all that much sense in this context, though, so the idea of Might and Napoleon was born – and some of those influences can obviously also be seen in Project Context. As for the future of this project, as well as Mighty and Napoleon, it’s not clear where Adobe is going to go, but Macy believes that it does point toward a future and that Adobe needs to experiment with interface like Context to stay ahead of the game.